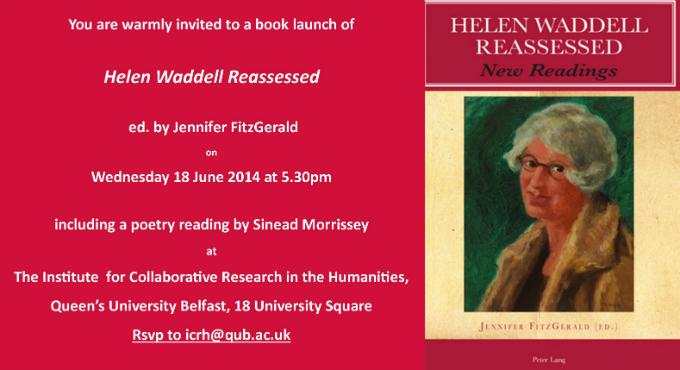 Part of my research into the life of Helen Waddell involved speaking with the knowledgeable Dr Jennifer FitzGerald, who launched her new book on Helen Waddell at Queens University Belfast. Poet Sinead Morrissey of the Seamus Heaney Centre at Queens University Belfast School of English, also read, both of her own poems and Helen Waddell’s. My research was made possible by an Arts Council NI Minority Ethnic Artist Support for the Individual Artist Award, which enabled me to have certain poems from Helen Waddell’s Lyrics from the Chinese translated into written and spoken Cantonese. Dr FitzGerald played one of these audio translations at the launch event. And I, being a woman, must stay. I know they will come too late. I had a plan would have saved the State. –But mine are the thoughts of a girl. And mine was the only way. Research and translation of selected poems from Lyrics from the Chinese was made possible by a 2012 Minority Ethnic Artist Award from the Arts Council Northern Ireland. Since I moved to Northern Ireland, I have been struggling with my ability to write a multilingual play; correction—I have struggling with whether I should even bother writing a multilingual play here because the odds of it getting developed and produced are incredibly slim, simply because Northern Ireland (and Ireland) lacks diversity in its pool of professional actors. I was able to do this only once before in NI, funded through a local government initiative called Art of Regeneration, run by Antrim, Ballymena, Magherafelt Borough Councils in 2007. I wrote a short play called What’s In A Name? 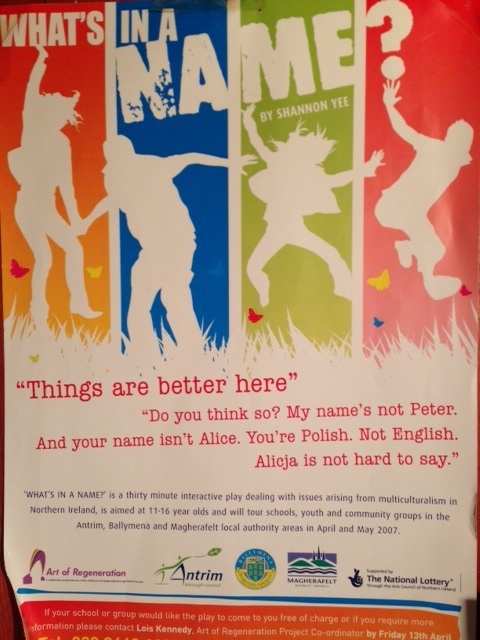 about a young Polish person named Alicia living in Northern Ireland and her process of negotiating a minority cultural identity, in particular, the significance of choosing an English name to call herself. I have plenty of experience with that. I’m biracial myself, where ‘American’ is often mistaken as short-hand for ‘white’. I remember completing the demographic section of a standardized test in school when I was 8 and thinking to myself, “I’m not fluent in Chinese, so am I allowed tick the box that says I am Chinese?” I have grown up in relatively diverse environments where a dialogue about race and ethnicity exists. I have worked extensively with young people in New York City and observed their own struggles around being a minority. The Polish actors in What’s In A Name? spoke both in Polish and English, and performances were followed up with a workshop led by the talented Charo Lanao-Madden about multiculturalism in Northern Ireland. The most popular feedback was that the young people enjoyed seeing Polish actors onstage, meeting them afterwards, and hearing Polish. That was in 2007, and I haven’t felt it was feasible for me to write a play in a language other than English in Northern Ireland since. Until 2013. 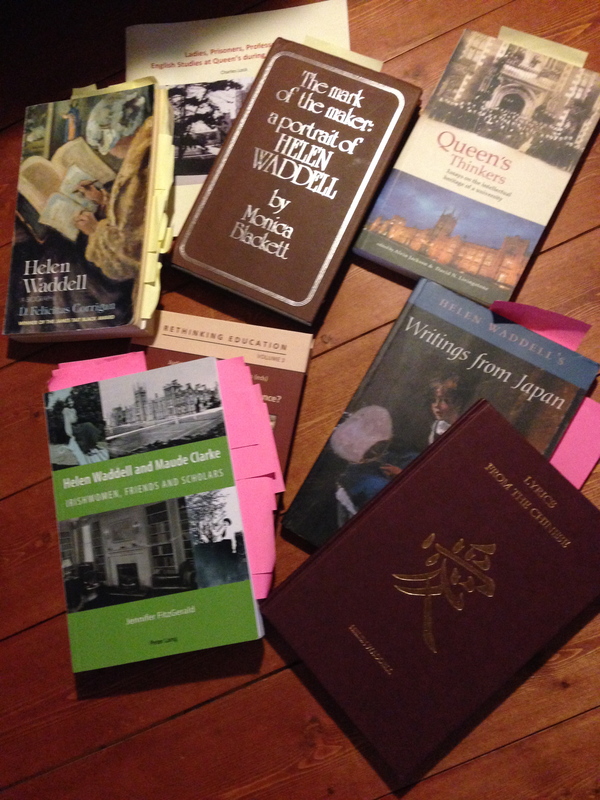 I secured an Arts Council NI Minority Ethnic Artist Award to research the life and poetry of local author Helen Waddell and create a short bilingual play (Chinese/English) based on her collection Lyrics From the Chinese, Waddell’s own life and its cultural plurality, and prevailing issues in contemporary NI. Half of the cast of characters in Redeeming the Time are Chinese, and half are Northern Irish. However, the play cannot progress through the vital stages of script development and then performance without Chinese actors and further support. 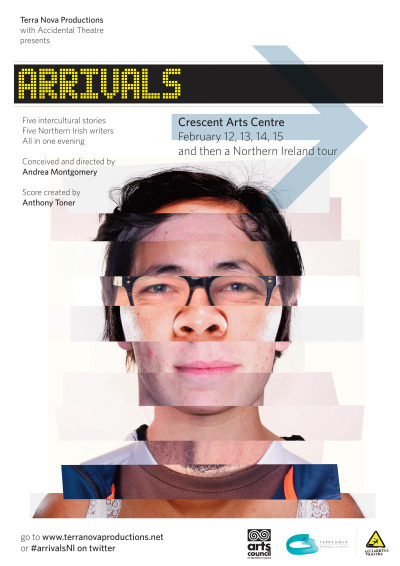 In 2013, I also received a commission to be one of 5 NI-based writers to participate in Terra Nova Productions’ evening of new writing, Arrivals, which opens tonight. Thanks to Terra Nova’s vision, I have been, at last, able to write for an ethnically diverse cast for a mainstage production that will tour around NI 12-22 Feb. As the actors are also multi-lingual (Punjabi, Romanian, Chinese, English), I have been able to include 4 different languages in my short play, titled Under Any Other Duties. On the Soundcloud track below, writers Deirdre Cartmill, John Morrison & artist Nandi Jola chat about the project with BBC Arts Extra’s Marie-Louise Muir. The other writers on Arrivals are Jim Meredith, Paul McMahon, John Morrison and me. Tremendous focus is placed on the act of listening to bridge cultural boundaries, particularly in NI. However, when it comes to cultural plurality, language is the essence of one’s ability to express oneself, to be heard and understood; from a playwriting point of view, without the actors to speak the languages, the conversation is one-sided. Delighted to have received an Arts Council NI Minority Ethnic Artist Award to research local writer, translator & academic, Helen Waddell, and create short, modern, bilingual plays based on themes of her life and her book of poetry Lyrics from the Chinese which is celebrating its centennial next year. In July, BBC Radio 4 presented an excellent piece about Waddell’s life and the importance of her work: Ulster’s Forgotten Darling.